Astronaut Tom Jones: We used Space Radar Lab to measure glacier motion from these Andean snowfields, but it was a visual treat to see these jewel-like icebergs adrift in the turquoise, glacier-melt waters of these fjords. A few years later I observed such glaciers up close in Prince William Sound and Glacier Bay National Park, Alaska. Rarely did shuttle missions reach the high (57-deg orbit inclination) latitudes, giving crews this view. 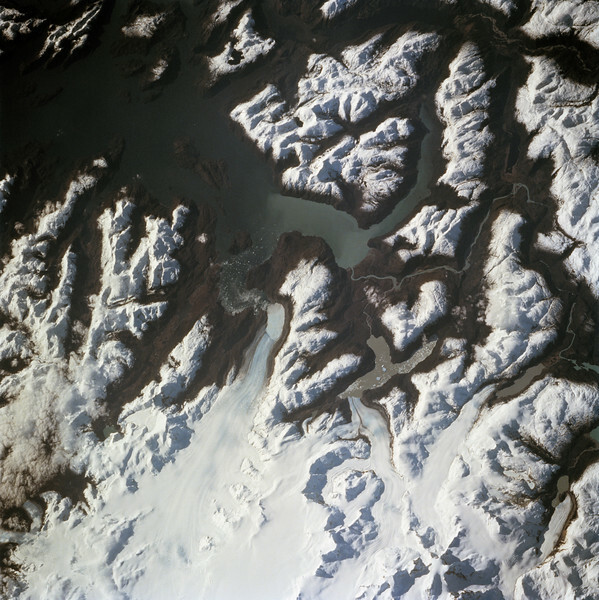 NASA: The ice visible along the bottom of this view is the north end of the larger (southern) of two great remaining ice field of the Andes Mountains in Chile. The longest glacier visible here flows down into the Calen Fjord (an arm of the Pacific Ocean known as Canal Baker) where numerous calved icebergs can be seen floating. The other three glaciers end in glacier-cut valleys with small lakes - the bigger lake has numerous icebergs as well. the river snaking through the mountains to the fjord drains water from the great Lake O'Higgins, which lies out of the picture to the right. Glacial mud can be seen emptying into the fjord and discoloring the water with its milky color.